When You Pray, in Whose Name Do You Pray? Does it Matter? HomeBlogSpiritualityIn Whose Name Do You Pray? 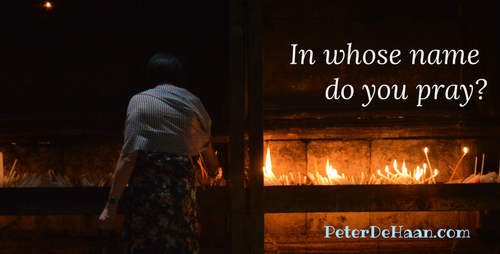 When You Pray, In Whose Name Do You Pray? This isn’t a trick question or a pluralistic way to approach the god of your choice. This is a simple question. When you pray to the God who is revealed in the Bible, whose name do invoke at the end? Different streams of Christianity prefer one over the over. Each has historical or theological reasons for their preference, not to mention the custom of their upbringing. While some Christians may be adamantly entrenched in one practice over the other, even to the point of dogmatic rhetoric, most give no thought to their unexamined habit. This ending words often spew out without a thought to their meaning or implication. I, for one, don’t think it really matters. A Trinitarian perspective says that God is three persons in one, so to fully embrace this belief means that either practice addresses the same God, regardless of the actual name or names used. Though I was taught one way and not the other, I now prefer to mix it up. For one, this helps to keep the end of my prayers fresh and avoid mindless repetition. It also reminds me that the God, as Trinity, is involved—regardless if I name him fully or implicitly. Last, it reminds me that just as there is diversity among those who follow God, there are also diversity in how to approach him. And that’s a good thing. It matters not what you say when you pray. What matters is that you do pray.